“When people vote for the ‘bell’ and the JVP candidate wins he would create a council in the village. This council will include distinguished persons in the village such as school principals, religious leaders, Grama Sevaka and other government employees. This would be the village council that will have all the powers in the village. They would decide what to develop in the village and how to spend the allocations the ward gets. This was stated by the Member of the Political Bureau of the JVP K.D. Lal Kantha in an interview with a national newspaper. Q: Is Mr Lal Kantha disillusioned with the JVP? A: We are the JVP. We would never get disillusioned with ourselves. There is nothing to say about poor attitudes people form due to their scantiness in politics. A: The people who are knowledgeable about politics know Lal Kantha will never be disillusioned with the JVP. Anyone who says Lal Kantha, who addresses more than 10 meetings a day is frustrated with the JVP should get their heads examined. We are working among the people for the victory of the JVP with enthusiasm and satisfaction. There was talk that Lal Kantha would join Mahinda. Did I join him?. 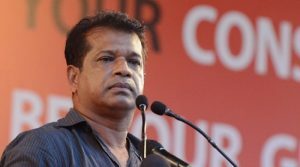 Some said Lal Kantha had connections with the UNP. Some Said Lal Kantha would abandon the party. Did it happen? Then some said there were internal conflicts. All these were proved wrong. We are fully satisfied with our party. I should get my head examined if I’m frustrated about the party when the whole country has a favourable attitude regarding out party. Q: The JVP goes around the country asking for the power in the village. What have you done to the people in the villages when you were ministers? A: We were given 4 ministerial portfolios. However, we had to abandon the ministries as soon as we started work. For, saving the country was more important than holding on to a ministerial portfolio. Chandrika Kumaratunga and Mahinda Rajapaksa tried to bring in Post Tsunami Operational Management Structure (P-TOMS) with the LTTE that would have given the LTTE certain powers in the North and the East. We had to come out of the government and struggle against the move and defeated the attempt by Chandrika Kumaratunga and Mahinda Rajapaksa. Q: Some say you came out because you could not cope up with the work. How could you develop the village? A: We do not ask for power in the village. When people vote for the ‘bell’ and the JVP candidate wins he would create a council in the village. This council will include distinguished persons in the village such as school principals, religious leaders, Grama Sevaka and other government employees. This would be the village council that will have all the powers in the village. They would decide what to develop in the village and how to spend the allocations the ward gets. What actually happens here is the vote for the JVP is power for the village. For the first time in history, the people in the village will have the administrative power of the village for the next 4 years when they vote for the ‘bell’. Q: You say that the UNP, SLFP and the ‘bud’ are in the same camp. If all three parties are in the same camp and if these are the parties that have done something for the people, will the JVP lose what it already had? A: The whole country is engulfed in theft, fraud, corruption and waste. When the village road is repaired the councillor steals; the official who looks after the quality steals. The contractor too steals. These three positions are the beginning of corruption. When it is the Central Bank there is Mr Ranil Wickremesinghe, UNP leaders, several officials and a businessman. What is in the village is ‘buddy’ plunder and what is in the country is ‘mega’ plunder. Q: How could the JVP change this system? A: First we should get power. Then we can show how all these three groups could be prevented from stealing and then develop the village. The people in the country know only that the JVP is the only party that does not steal. This time the UNP, the SLFP and the ‘bud’ will be defeated. Only the JVP will come forward. Q: Are you quite sure about it? A: We are quite sure as people who had supported other parties come to our meeting and tell us they had been deceived by those parties but they would vote for us this time. Q: The JVP had 39 MPs at one time. Now it has come down to 6. Despite shouting on stages, doesn’t the number of MPs you have now show the disapproval the people have towards the JVP? A: People now think they have been foolish all this time. They are sorry that they could not give us power. The people have realized they had erred when they reduced us from 39 to 6. It is this error the people want to correct this time. Q: Do you recall how you repeated this story on every platform of every election that was held? A: The people in our country act according to habit. However, there is something I have to mention. There is no talk of victory or defeat for the JVP. A win, as well as a defeat, is for the people. It is only when people get a good shot to their brain, that they will change their habits. Now it has hit them in the brain, body, stomach and everywhere else. This is the very reason that they will change. The world will not remain in the same place every day; neither will politics remain in the same place. According to Buddhism, the world is subject to change; even in Marxism, the world is subject to change. People too change. That is apparent to us. Instead of making a lot of predictions, let us wait and see what happens on the 11th. Q: Due to whatever opinion, people believe that the JVP is a ‘Deal Party’. What do you say to that? A: Ranil Wickremesinghe does not have any files on us. Neither does Maithripala Sirisena. Even Mahinda Rajapaksa does not have files on us. However, Ranil’s files are with Mahinda, Mahinda’s files are with Ranil, Maithri’s files are with Mahinda, Mahinda’s files are with Maithri as well as with Ranil. All three factions have files. It is those people who have files that do deals and work. By putting deals with Ranil, Maithri or Mahinda, what will we gain? Especially from top class thieves! However, we talk to them in Parliament. That is when we need to get Acts and Bills passed, to fulfil the requirements of the people. We do not like to speak with Ranil. However, we do talk with the Prime Minister! Q: Why is it not possible to remove that opinion from the minds of the people? A: The people do not believe, and when you from the media ask these questions, it gets into the minds of the people too. When persons who are full of thefts, corruption and fraud say such things on stages, it goes into the heads of the people. You are the ones who are perpetuating those. Q: Then give me an answer to the view, that the previously independent and principled, JVP is now dilute. A: There is nothing like that, and when you ask this question, people begin to think that something like that does exist. The JVP is the most organized Party. All other parties are diluted. They jump from here to there and there to here! We do not even have such people. We do not have diluted policies either. When you all and politicians make up things against us, problems that do not exist enter the heads of the people. Q: So, you think it’s wrong for the media to publish what politicians are saying? A: No. What politicians say is being spread through the media. When politicians are incorrect publishing such inaccuracies is also wrong. I, of course, do not trust politicians in Sri Lanka. Nor do I trust the media. Neither, do I trust the State institutional mechanism in this country. If people accept us, we win. If they do not, then we lose. Our country is one of the most corrupt in the world. If people vote for the UNP, SLFP and the Flower Bud this time around as well, Sri Lanka will become the most corrupt country in the world. If you want that to happen, then you can vote for them. Q: Will the JVP, that talks with such confidence, gain power in at least two or three Pradeshiya Sabhas? A: The JVP is a massive organization. Ask the people whether the JVP will win or not, rather than asking us. Ask them and tell us through a survey. Even if you ask us or anyone else, they will say they will win. However, when you inquire from the general public about the JVP, the story that can be heard is that the JVP too has become a useless Party now. Q: How many of the persons involved in the controversial Central Bank Bonds Scam, will fall to the President’s sword? A: We do not believe in what this President says. We do not believe in what the CID, the Judiciary, the Bribery or Corruption Commission, or the Attorney General says. The people of the country too do not believe. However, those institutions have a responsibility to create trust among the people. Apart from shouting about thefts, frauds and corruption, nothing else is being done by Maithri. There are some veteran thieves on Maithri’s lap. Today the people are of the understanding, that if the JVP and the media get together and intervene, it will be possible to get something done, even something small.